A former president of Maldives, who was in power for three decades, has been arrested at his home as a crackdown on the opposition intensifies. Maumoon Abdul Gayoom was detained after the government declared a 15-day state of emergency, suspending parliament and sending police to the Supreme Court. President Abdulla Yameen has refused to comply with a court order to release political prisoners. The army have been ordered to resist any move to impeach him. The court also ruled that the 2015 trial of another former President, Mohamed Nasheed, had been unconstitutional. 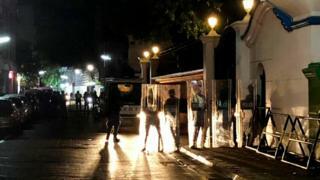 Judges who were at the Supreme Court when police arrived have reportedly been held against their will overnight. Boris Johnson, foreign secretary of the UK, the former colonial power, called on President Yameen to lift the state of emergency. "The damage being done to democratic institutions in Maldives and the sustained misuse of process in Parliament is deeply worrying," he said in a statement. The US National Security Council has warned in a tweet that "the world is watching" the Maldives, which has a population of 400,000 and depends on tourism to power its economy. Last week's Supreme Court ruling very much caught the government on the back foot but it had been difficult to see how they would manage to avoid implementing it in the face of domestic and international pressure. With drastic measures, it seems. President Yameen clearly saw a threat to his rule and is pulling no punches in fending off the challenge. The mood has turned from tense to fearful. More arrests are expected to take place overnight. Maldivians are passing around messages telling one another to "be safe". With many constitutional rights suspended, there is little protection. How important is Mr Gayoom? Now aged 80, he ruled the country autocratically before the Maldives became a multi-party democracy in 2008. A half-brother of current President Yameen, he has now aligned himself with the opposition. He was detained in a police raid on his home, the opposition says. Shortly before, he tweeted about a large police presence outside. In a video posted online the ex-president addresses his supporters (in Dhivehi), saying that he has not "done anything to warrant arrest" and urging them to "remain strong". What happened at the court? There were judges inside the court when it was stormed but a court spokesman said he was unable to contact them. "I just spoke to the Chief Justice and he told me that the gates of the Supreme Court [were] being stormed by the military," Husnu al-Suood, president of Maldives Bar Association and a former attorney general, told Reuters news agency late on Monday. "He is inside and nobody can go out or come in. The emergency means the Supreme Court activities are suspended and nobody is in charge of the judiciary." A Supreme Court spokesperson told local media that security forces were holding all the judges against their will. Mr Nasheed, the island nation's first democratically elected leader, was convicted under anti-terrorism laws of ordering the arrest of a judge and sentenced to 13 years in prison. However the verdict was internationally condemned and he was given political asylum in the UK the following year after being allowed to travel there for medical treatment. The Supreme Court also ordered the reinstatement of 12 MPs, which would see the opposition's parliamentary majority restored. How else has the government responded to the court ruling? It sacked the police commissioner for pledging to enforce the ruling and ordered the detention of two opposition MPs who had returned to the Maldives. The Maldives previously declared a state of emergency in November 2015, after the government said it was investigating a plot to assassinate Mr Yameen. That move came two days before a planned protest by Mr Nasheed's Maldivian Democratic Party. How has the opposition reacted? Mr Nasheed, who is in exile in Sri Lanka, told BBC News that the government's "brazenly illegal" actions amounted to a coup. "Maldivians have had enough of this criminal and illegal regime," he said. "President Yameen should resign immediately." An opposition MP, Eva Abdulla, said the state of emergency was a "desperate move" that showed the government had "lost everything [including the] confidence of the people and institutions". What is the Maldives better known for? Breathtakingly beautiful beaches and breathtakingly expensive luxury hotels, says the BBC's South Asia correspondent Justin Rowlatt. The nation is made up of 26 coral atolls and 1,192 individual islands. But while the water of the coral reefs that surround them may be crystal clear, politics in the "island paradise" has always been very murky indeed, our correspondent adds. Since President Yameen took power in 2013 the country has faced questions over freedom of speech, the detention of opponents and the independence of the judiciary. Have you been affected by recent events? If it's safe to do so, you can share your experience by emailing haveyoursay@bbc.co.uk.